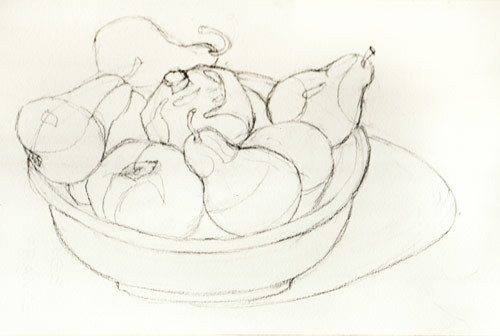 Better Bowl of Fruit, Better Watercolor: Now I Can Eat the Fruit! 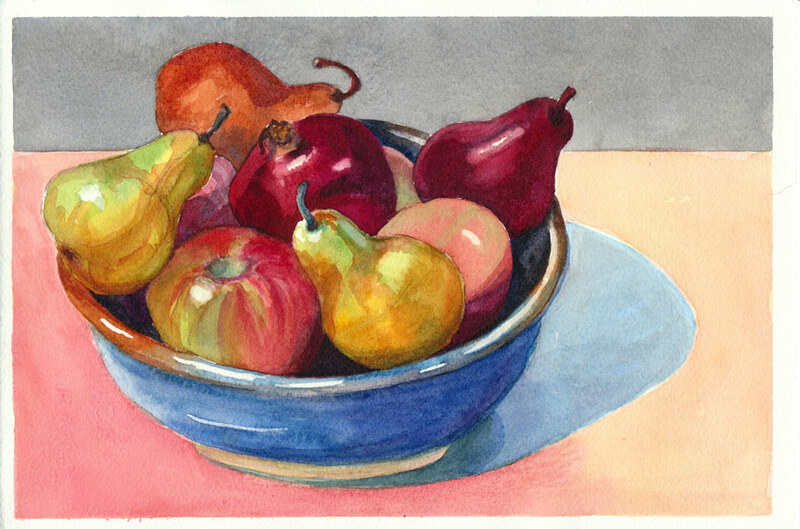 Better Bowl of Fruit, Watercolor on paper, 7" x 10.5"
I’m so much happier with the way this watercolor of my bowl of fruit turned out than the one in my sketchbook. It makes such a difference to use Arches 140 lb cold-pressed watercolor paper. It also helped that I was painting consciously and taking my time, instead of rushing through it, half asleep as I had been when I made the sketch. Even more fun is that I made the the large porcelain bowl when I was a potter and had glazed it with two of my favorite glazes…and now I was “glazing” it again, in watercolor. I enjoyed every bit of the process, from planning the composition, to drawing (see below) from life, to masking the whites, then painting one shape at a time, using juicy washes, adding color wet-into-wet, as well as glazing over dried washes, then removing the mask, softening the highlights and some edges. Since I’m teaching a watercolor class right now, I tried to also pay attention to my process so that I could better explain to my students how and why I did what I did. I surprised myself with the range of techniques I was actually using in one painting. Even though in class we study them as separate techniques (flat wash, graded wash, wet-into-wet, etc.) you often need them all in one painting and sometimes in one passage of a painting. This painting is obviously more polished and finished than the sketch. Bit they are both very good each in its own way. I like the ease and imperfection of the sketch, the carefree feeling of it. I’m a beginning….don’t quite think I can call myself a potter, but I’ve got a kiln bought specifically to make tiles. Now I’m obsessed with making a cup! I’ll have to post a sketch of my first effort…..pretty wonky!! This is just lovely! And your “boring technical stuff” is a terrific learning opportunity for me. Thanks for including it.